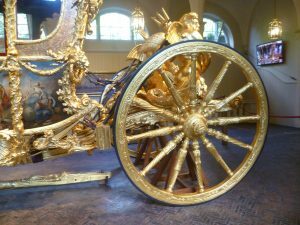 Last Tuesday, I was invited to the Bloggers’ Breakfast at the Royal Mews. 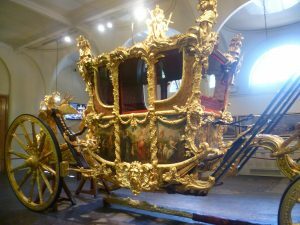 I particularly wanted to see the Gold State Coach, the one used at the Queen’s coronation. I’d seen it a number of times on television, of course, but I’d never seen it for real. My first impression was that it was enormous – which it is at 7.3 metres long, 2.5 meters wide and 3.9 metres high. It lives in the State Coach House and it’s quite a business to get it out when it’s required. First of all, they have to remove a false wall and a window; then everything that can be, must be got out of the way; and only after that can it be turned the necessary 90 degrees and pointed at the now-revealed door – and that alone takes two and a half days. It was built in 1762 for King George III and it has been used in every coronation since George’s IV’s in 1821. Not every monarch has liked it: William IV (‘the sailor King’), who was crowned in 1830, said it was like a ‘ship tossing in a rough sea.’ At least he was used to being at sea; what his wife Queen Adelaide thought, history does not relate. It was probably unprintable. King George VI described his coronation procession in 1936 as ‘one of the most uncomfortable rides I have ever had in my life’. Why is it so uncomfortable? First, the wheels wore unevenly over the years until, eventually, they were no longer round. And second, the body of the coach is suspended on four, two metre length straps, each of which is strengthened with six rows of hand-stitching. Inevitably, the straps stretched, and they, too contributed to what Queen Victoria called, with commendable restraint, its ‘distressing oscillations’. The wheels have been ingeniously returned to being circular by winding more than 1,500 metres of crepe surgical bandage round the outer circumferences, which were then impregnated with plastic until it reached a depth of 5 centimetres. Then, they were meticulously planed until they became, once again, four perfect circles, and new solid rubber tyres were bonded on. Given that the Gold State Coach is over 250 years old, this is probably the best solution that can be found. At least it doesn’t have to drive over 18th century roads. As for the straps, they were replaced in the late 1970s, and the suspension had a further complete overhaul by Master Saddler, Johan Ulvede, in 2011. He gave the coach four new leather suspension straps, each meticulously hand-stitched. It’s never going to be a very comfortable ride but one hopes that it is now bearable. So, what about the decoration? Visitors, apparently, often ask if the coach is solid gold. The answer is, No. It’s made of wood and leather and steel but it is heavily gilded and the resulting golden shine can take your breath away. 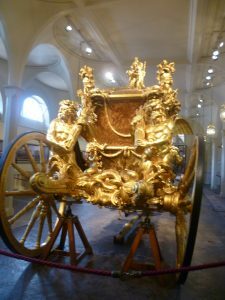 The front and back of the coach are decorated with gilded sculptures of four sea-gods, half-man, half-fish, called tritons, and the two at the front are blowing conch-shell horns. The 16th century poet, Edmund Spenser, wrote about, ‘Triton blowing loud his wreathed horn’ and the image would have been a familiar one to the triton’s sculptor, Joseph Wilton. These painted panels are by the Florentine artist, Cipriani (1727-85) and they represent, metaphorically, the triumph of Britain over France in the Seven Years War, as portrayed by various Classical gods and goddesses. Basically, this war was about which country ruled America and India, and France wanted to expand her influence in both. Our guide, however, told us that the coach decorations represented peace, and she pointed to the broken spears held by the plumed helmeted bust of one of the warriors on each corner of the roof. You can also see the barley-sugar trunks of palm trees which stand on either side of the door panels, and the palm represents peace, too. Or, more accurately, it represents Victory – which brings peace, once the enemy has been subjugated. And, at the back of the coach, two tritons are each holding the Roman fasces, a bundle of birch rods, tied with a thong, which represents Roman justice, which 18th century Britain believed she had inherited. I couldn’t help but detect a note of irony in all this. My last photo shows the coach and horses ready to go. The coach, which weighs almost four tonnes, as much as a fully-grown elephant, needs eight horses to pull it, and they go at walking pace only. The coach is postilion-driven. That is, there is no coachman on a box at the front; instead, well-trained postilions ride the nearside horse of each pair and it is they – and especially the rider of the first nearside horse – who is responsible for driving the coach. 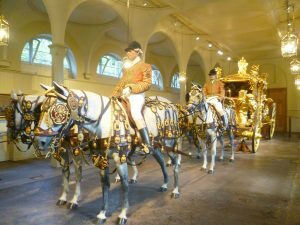 It is a weighty responsibility and, looking round the Royal Mews, and listening to our excellent guide, I could see that the watchword is meticulous professionalism. It is a most interesting place and I thoroughly recommend a visit. 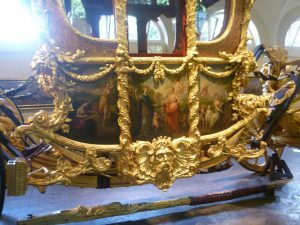 There is a companion post to this, ‘Coaches and Landaus’, on The Historical and Regency Romance UK blogspot. Totally fascinating, Elizabeth. Thank you. So much detail that I had no clue about. Thank you, Joanna. I’m glad you liked it. 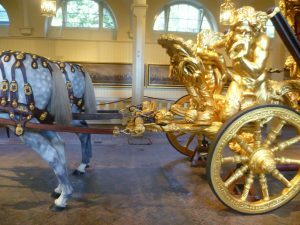 All the coaches in the Royal Mews have fascinating stories; it’s a great place to visit. I learnt a huge amount, too. Very interesting. I did see it when I was a child, but remember only how gold it was and how big. I’ve heard before that it was an uncomfortable ride and some Royals felt sick when riding in it. Horrible, if you happen to be going to your coronation! Great post. Thank you for dropping by, Elizabeth. The Queen also travelled in the Gold State Coach to St Paul’s Cathedral for the Silver Jubilee Service of Thanksgiving in 1977, and again for the Golden Jubilee service in 2002. Still, at least she had twenty-five years between the two journeys. Fascinating. I’d heard the William IV comment before, but hadn’t known why it was such an uncomfortable ride until I read this. Thank you! I agree, Jan. It makes me feel sea-sick even reading about it!